If you are thinking of getting married and would like to have the ceremony in Kimmage Manor Parish we hope we can help you get the process started. There are a few things that you will need to do so please the details below. Three Months notice is required to be given to your own priest in advance of the date of the proposed marriage. If either of the party is younger than 18 years of age the period must be six months. You must provide the priest of the parish that both parties reside with your Baptismal Certificate and Confirmation Certificate; - these must have been issued within the previous six months. You will also be required to fill up a Pre-Nuptial Inquiry form in the presence of the priest. If one party is of a different religious denomination, the Catholic Priest can prepare their documentation. The Priest of the parish can send these documents to the parish priest of Kimmage Manor Parish; these should reach him at least one month before the date of your wedding. A 50 euro deposit is required for documentation preparation and to ensure reservation of the Church of the Holy Spirit Kimmage Manor for your wedding. Three months notification must be given to the local Registrar of marriages. These documents can be obtained from the Parish office. We recommend the wedding party prepare their wedding liturgy beforehand. The priest will be happy to assist with this. The officiating priest may be any priest of your choice. We recommend a priest who may be related or personally known to you, this should be the one who prepares you for your wedding. He will receive the necessary canonical permission to perform the ceremony. A list of Church Organists and those who will prepare the church with flowers is available from the parish office. 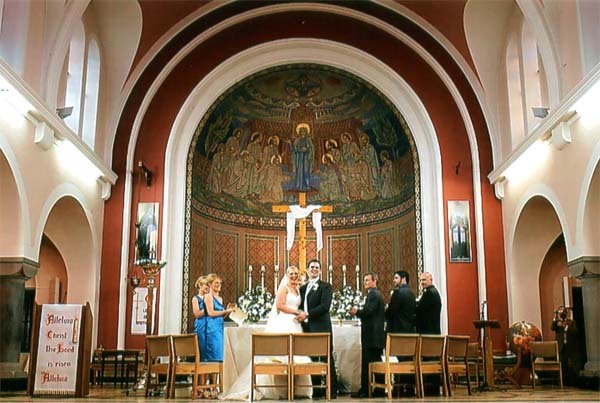 The Church is very popular with wedding ceremonies and many people outside the parish choose here as their venue of choice. We value the help of parishioners in ensuring the church remains a place of beauty. We would ask the wedding party to make a stipend of €450. To confirm your reservation a non-refundable deposit of €50 is required. The Stipend can be paid to the parish office three weeks before the wedding. We recommend couples go through Naomi Pre-Marriage Courses. These take place on Friday evening and Saturday morning. A full list of dates for these courses can be found at http://www.irishweddingsonline.com. If you have to cancel or need to change your plans, please keep us informed. Please make sure to leave plenty of time to take care of all the necessary details. In the week leading up to your wedding, a wedding rehearsal can be arranged through the Parish Office. For those living abroad, please deal with your local priest and documents can be sent through to us through the Bishop of Diocese.